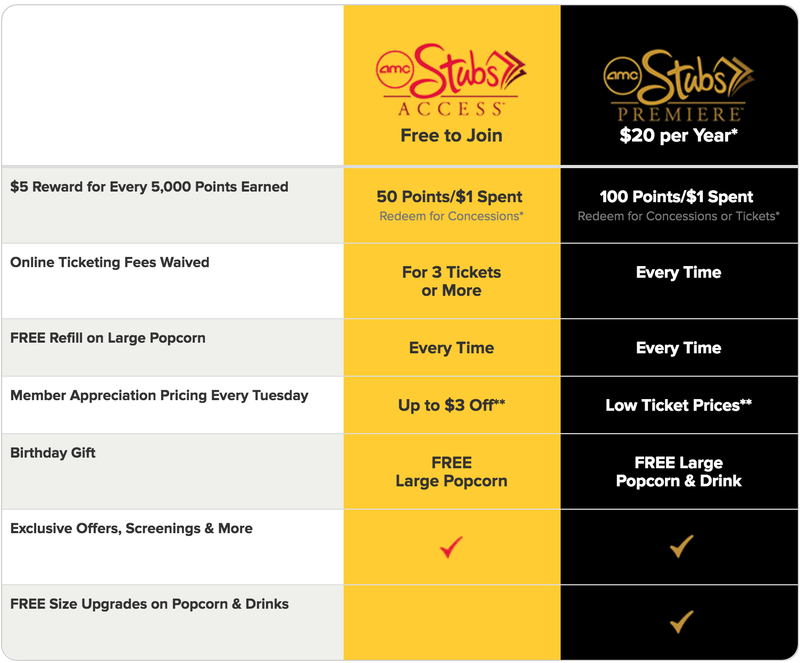 How much does Stubs membership cost? I heard they have come up with free option, is it true? Is it worth paying for the paid Stubs membership? 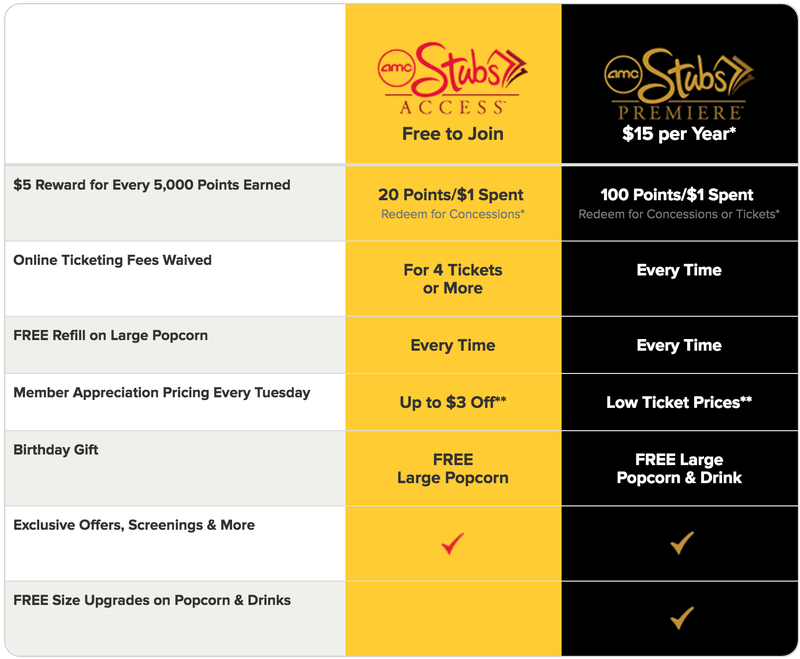 Tell me the difference between the free and the paid membership in a way i can understand. 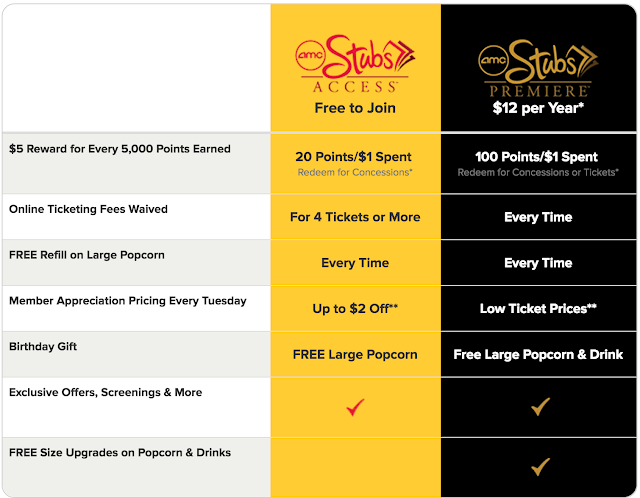 AMC has introduced new stubs program in April 2016 in Detroit, Dubuque, Houston, Miami, Omaha, and the Bay Area. The cost of membership in bay area is $20. This article is based on the premiere membership fee ($20) in Bay area, California. 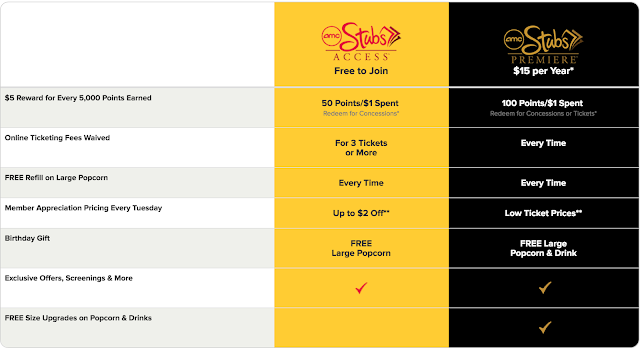 Access is free and you get 2% back in rewards - $5 rewards for every $250 spent. Online purchase fee waived only if you purchase 3 or more tickets. Rewards can be redeemed only at concessions (not for tickets). 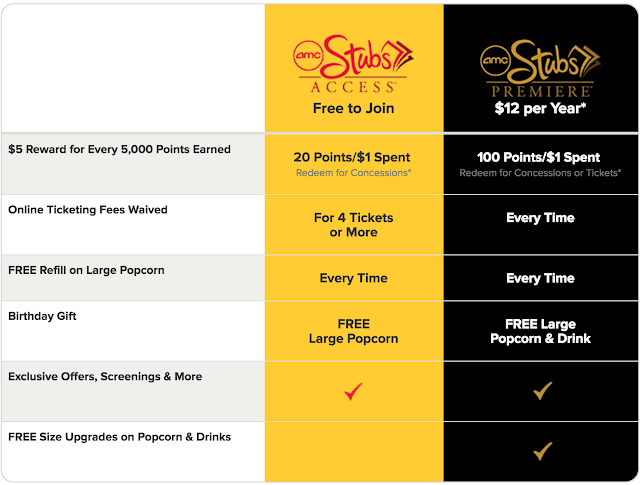 The points expire after 12 months of inactivity. Premiere costs $20/yr and you get 10% back in rewards - $5 rewards for every $50 spent and no minimum purchase requirement to waive online purchase fee. 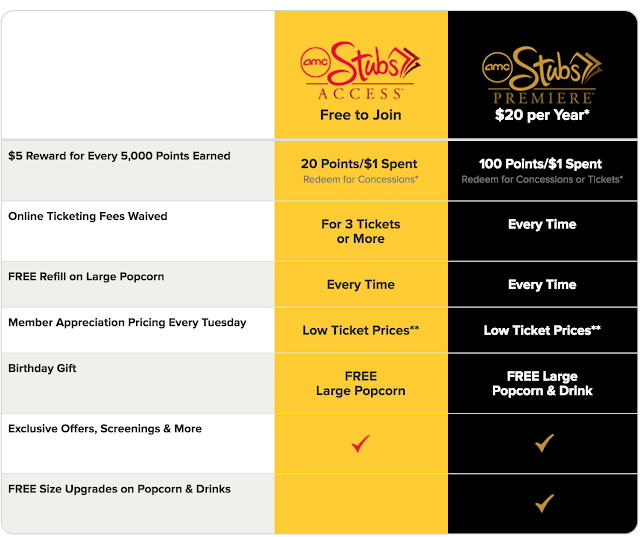 Rewards can be redeemed at concessions and for tickets. Also, you get 2000 points for the $20 you pay for the membership. You get to skip the long line in ticket and concession stands, especially on weekends, you don't want to spend the time in the long queue. Usually there may not be a queue at all. May vary by location and time. Note: The information entered here will be saved by this blog. No information other that that entered by the user will be saved. Disclosure: This is just my view. Use your own judgement. Appreciate your comments. I would be glad to know what you think? If you think you will spend $250 or more in tickets and snacks in a year, Premiere works best for you. 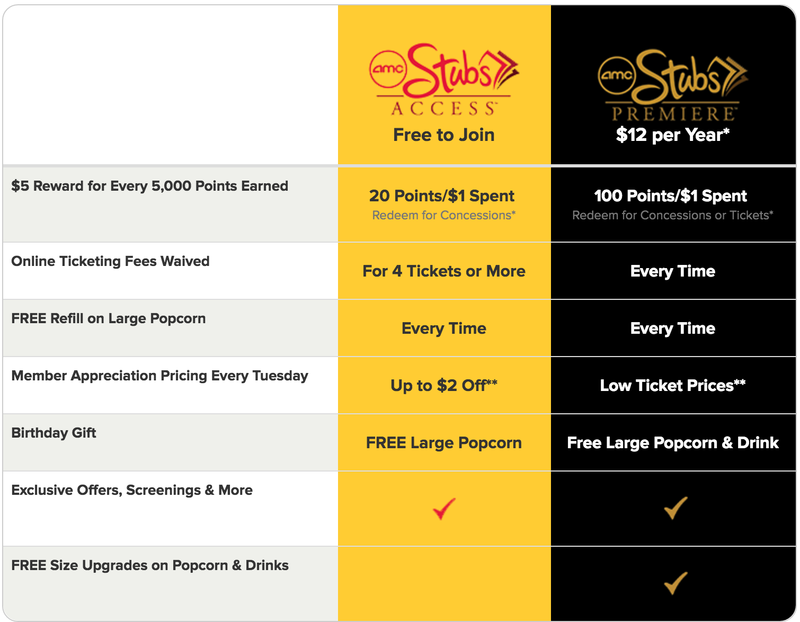 Even if you don't spend $250, if you end up booking online, 1 or 2 tickets at least 7 times in a year (online fee: $3 x 7 = $21) Premiere is good as you will get back the cost of membership in online fee savings. The information in this article may be out of date. For accurate and up to date information please visit amctheatres.com or your nearest AMC theatre. Good article. Got a better idea about the stubs memberships. Another unexpected benefit: Some theaters have "Premiere" concession lines, similar to the TSA Pre-check lines at airports. This is especially nice when you attend the opening weekend of an anticipated blockbuster, not having to wait in LONG liens for snacks! Another unexpected benefit: "Premiere only" concession lines. Very nice not to have to wait forever to buy your snacks when attending opening weekend of a blockbuster film! Samsung Galaxy Tab A 10.1" Tablet, Octa-Core, 2GB RAM, 16GB HDD, SM-T580NZKMXAR -New other - This tablet features 10.1" screen size and Octa Core processor. It comes with 2GB RAM and 16GB storage capacity.